I started using Reader Magnets a little over six months ago. I didn’t even have a term for it back then. Since I put these measures in place, over 15,000 readers have signed up to hear from me about new releases and promotions – all in just a few months. My readers trust me with their contact details for good reason. I give them good content. In return, they buy my books. These guys are my fans. I appreciate every last one of them – and they’re the reason I get to write for a living. I downloaded this book from an email I received. What can I say I’m always interested in finding new ways to get my Name out in the universe. I am an author and I work hard at what I do. Writing is not as easy as everyone thinks it is. Or should I say everyone can write a book, all books are not created equal? 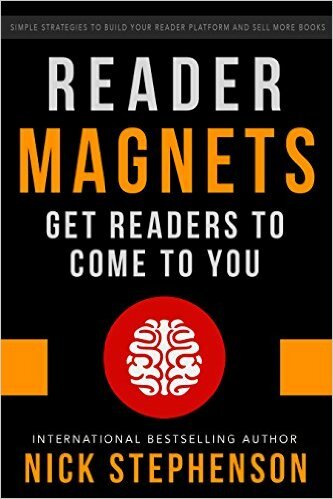 Reader Magnets: Build Your Author Platform and Sell More Books is short and straight to the point with no BS involved. Loved it! Nick Stephenson lays out the simple steps you need to build an author platform, but those steps do take time. I have read about his theory on a few other blogs and from some books I have picked up and I’m in the process of applying what I have learned from him. Reader Magnets is all about one permanently free book, funnel books, and building up your fan base. I’m tempted to write more about Nick Stephensons process in this post, but because Reader Magnets is straight to the point I’d probably, unintentionally, give his whole book away in this review.